I had a great time in Carmel at the Local Authors Live festival. As I mentioned last week, I haven’t done a festival before and, while I sold about as many books as I do when I give a workshop, there was a definitely different feel to the day. Obviously, not everybody there is a writer, but everybody is a reader, and don’t ask me to figure out which group scores higher as my favorite type of person. People stopped and talked, just to take a look at what books we were selling, and swapped stories–whether or not they ended up buying a book. And, you know, I just can’t see the not-buying as a big downside (says the lousy marketer in me). A lot of bookmarks went away, and I’m pretty sure 3 or 4 people went off with a new idea about getting together with their friend who also writes or finding a group at some time, to start the critique process. Which just feels good. Everything was very well-organized and, it seemed, also well advertised, because there were always two or three groups of people strolling by, smiling, making eye contact, or stopping at our table to see what was up. The weather was FREEZING–the fog cleared for maybe a half hour, and the wind never really died down. Luckily, I’d brought layers, although the me that grew up next to Pismo Beach must have had a brain fart, to think that sandals were appropriate wear for the central coast in July. 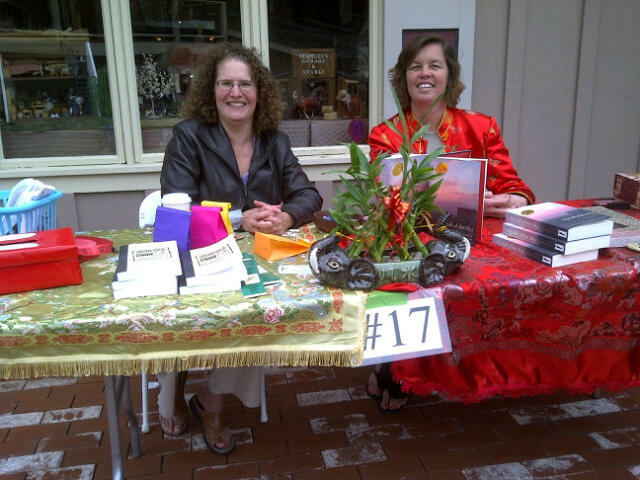 Here’s a picture of me and Jana McBurney-Lin, one of my critique partners and the author of My Half of the Sky. Jana’s wonderful novel is set in China, about a modern young woman struggling to hold up her half of the sky, despite the pushes and pulls of her traditional village. I think the gorgeous Chinese cloths she brought really made our table call out to people. Another critique partner, Terri Thayer, was scheduled to come down with us, but she had a deadline looming. We missed her, but all of her fans will be happy to know that she stayed home to write furiously (and brilliantly) on the next book in her Dewey Pellicano quilting-mystery series. All in all, I’d give the book festival a 10 (despite the fog and the worst sunburn I’ve ever had!). You know, it had a great beat, and you could dance to it. I’ll definitely be keeping my eye open for more festivals in the area. That’s cool that you did well at the festival. My experience in terms of book sales is that I definitely don’t do as well at festivals or book store signings as I do when I speak. But I think it’s because I’m a lousy marketer. Maybe if I had Chinese fabric on my table it would help! Did you say it was freezing there? So hard to imagine, since we’re having 100 degree weather. Love Carmel; sounds like a great event!